I love feeling my leggings tight around me. And my bra top, too. Especially, when the workout is more intensive. It makes me feel more secure and less bouncy. And I wouldn’t get distracted during the workout because of feeling uncomfortable in a flouncy top or bottoms. That’s the reason this set here (Stronger) is one of my most favorite. Surely, too tight isn’t good either. Comfort is an absolute must, because I have had uncomfortable activewear, and it didn’t find a place in my wardrobe for too long. And comfort for me also involves high rise leggings. It just gives me more comfort. Of course. And so many things fall here. Like the fabric. Synthetics vary so greatly from one another. Some will make your sweat more, others will be much comfortable. I always pay attention if the fabric is breathable. Durability is also an important factor. 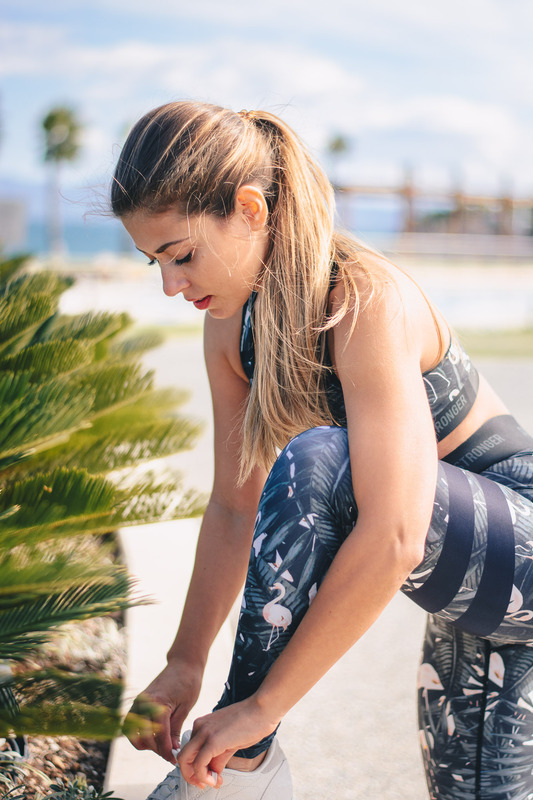 Activewear pieces are worn intensely, sweat in intensely and washed after every single use – they need to be able to resist this without tearing apart after one month. I think it’s easy to spot this in a single sight. If waking up early and doing your training wouldn’t put you in a good mood instantly, try to boosting it like me. I love wearing something fun, chic, why not colorful – it has always impacted me well. And my confidence, too.